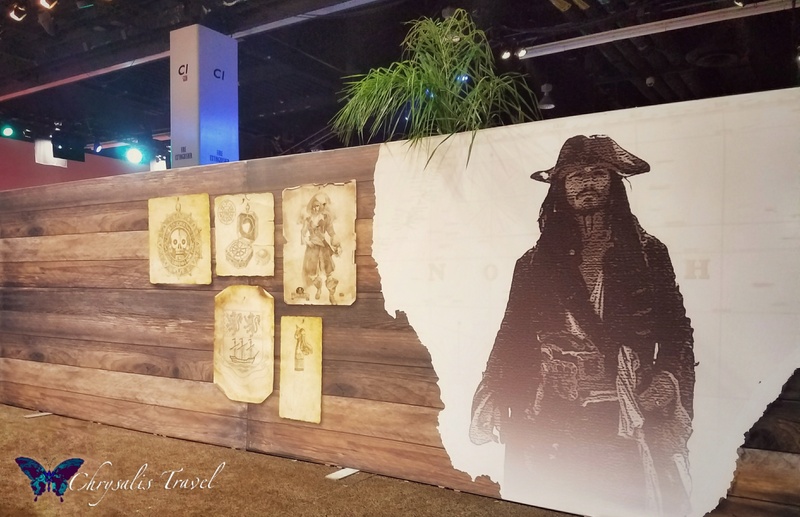 How many of you love Pirates of the Caribbean? 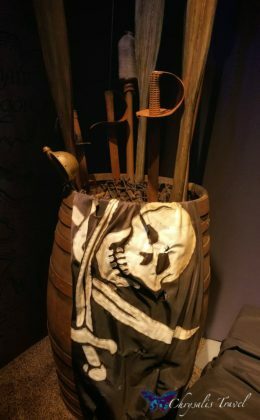 Was your first memory of Pirates from Disneyland? Or perhaps Disney World? For younger generations, their first Disney pirate may have been Captain Jack Sparrow from the blockbuster films. 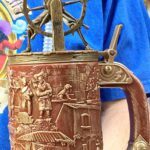 Well, if ye come seekin’ adventure, keep a weather eye open. 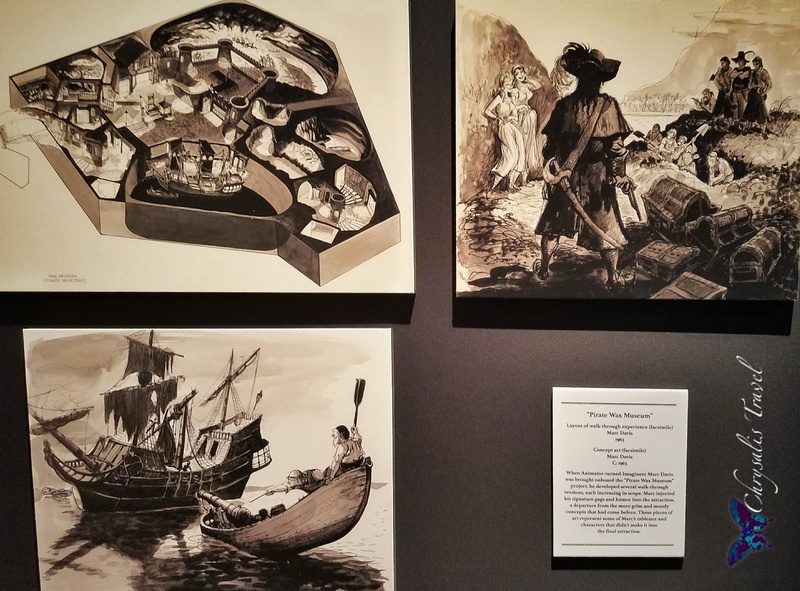 There be pirates in these waters as we explore their history through Disney Archives. The queues snaked on and on for this exhibit. 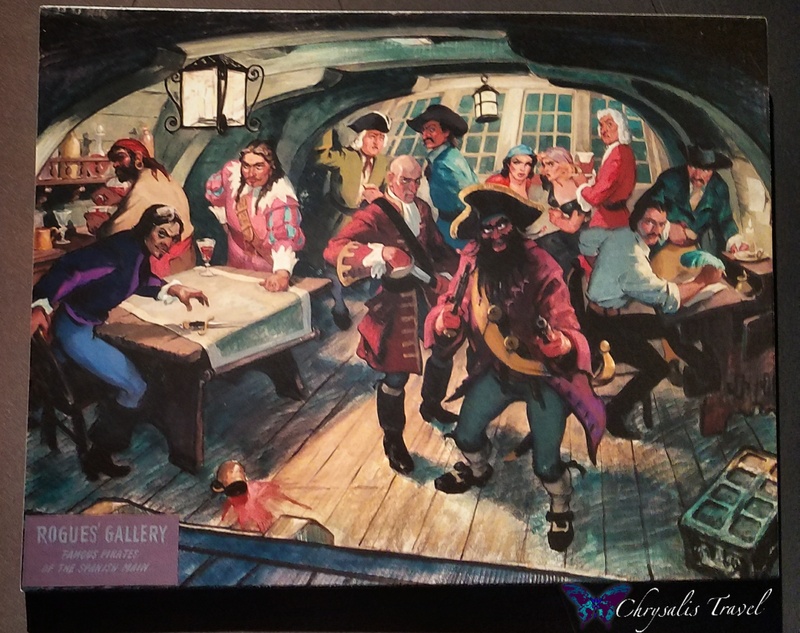 The mood was set with music of Disney’s pirates – from X Atencio’s classic ‘Yo Ho! Yo Ho!’ to the Hans Zimmer film soundtracks, to songs from Muppet Treasure Island and Hook’s solo “Revenge! Revenge!” from Once Upon a Time. While waiting in the queue, guests could enjoy extraordinary entries from the Design Challenge. 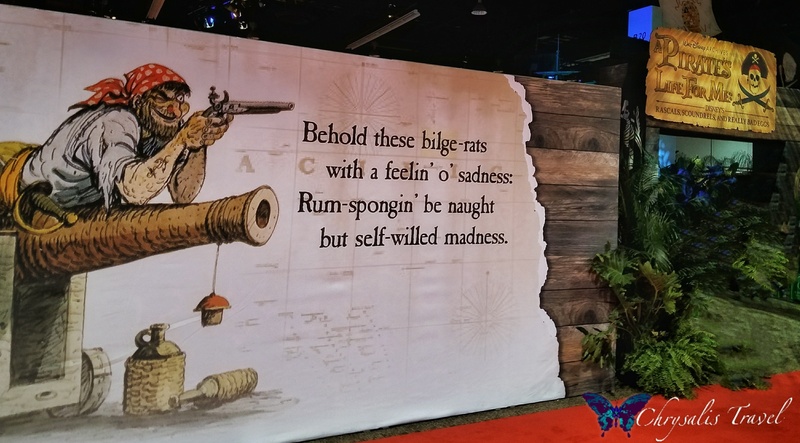 The theme honored 50 Years of the Pirates of the Caribbean at Disneyland. There were so many remarkable pieces of fan art. These were some of my favorites. 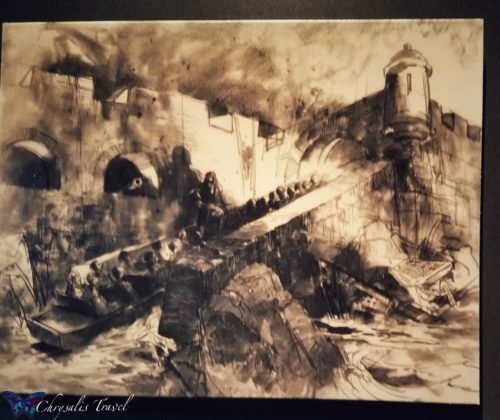 The artist cut this image from one piece of paper. 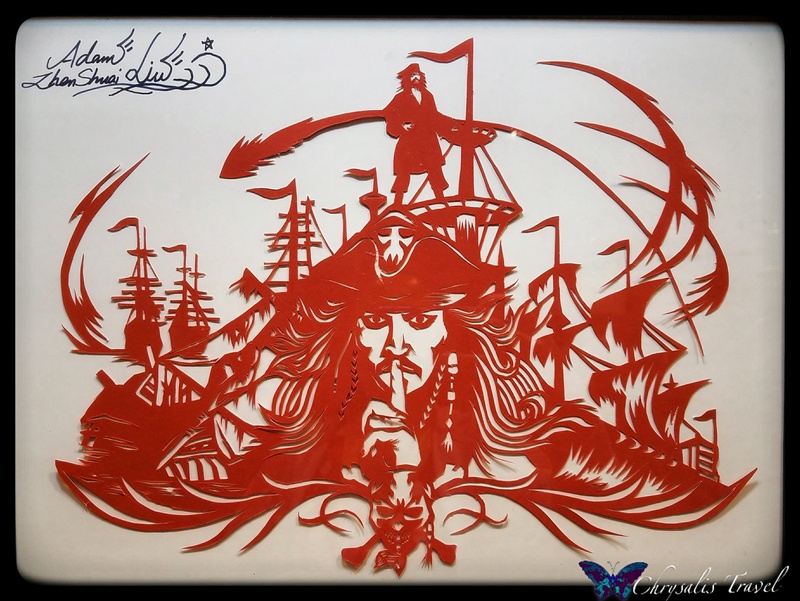 It is a striking likeness of Jack Sparrow with many pirate ships. Look closely. The overall silhouette created by the pirate ships outlines a Disney castle. 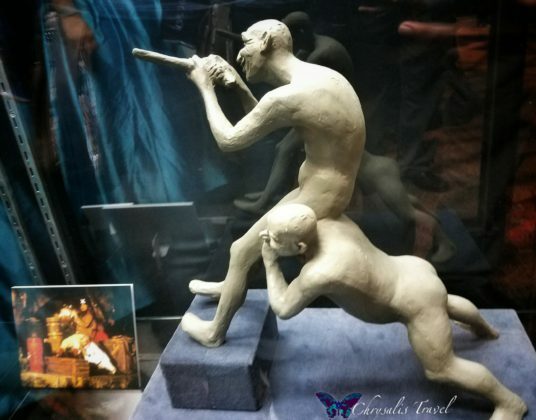 Having been to all six Disney castles, I particularly adore this piece. 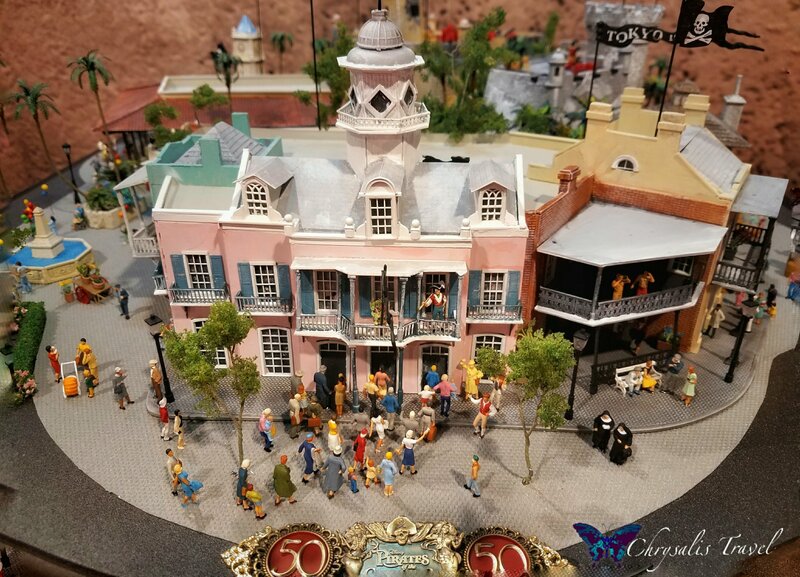 This model features façades of all the Pirates rides in Disney Parks around the world. Front and center is the original Pirates in New Orleans Square. To the right: French-inspired entry in Tokyo Disneyland. To the left: Spanish fort from WDW’s Magic Kingdom. The grey stone fortress (right, back) guards the attraction at Disneyland Paris. And the terracotta fortress (back, middle) houses the most advanced Pirates of all – in Shanghai Disneyland. If you counted five, that’s correct. 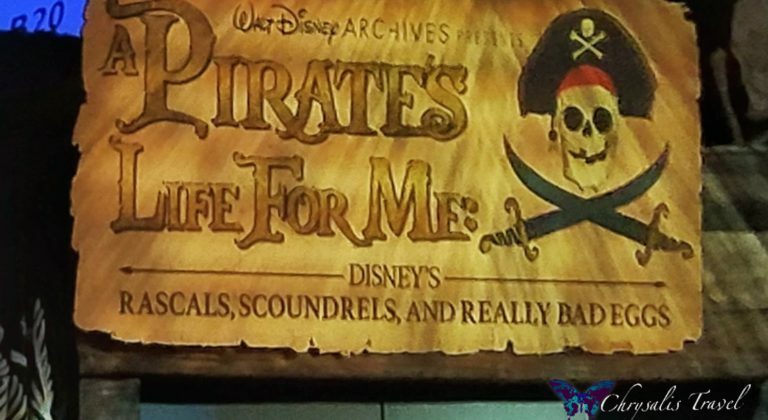 Hong Kong Disneyland does not have a Pirates attraction. 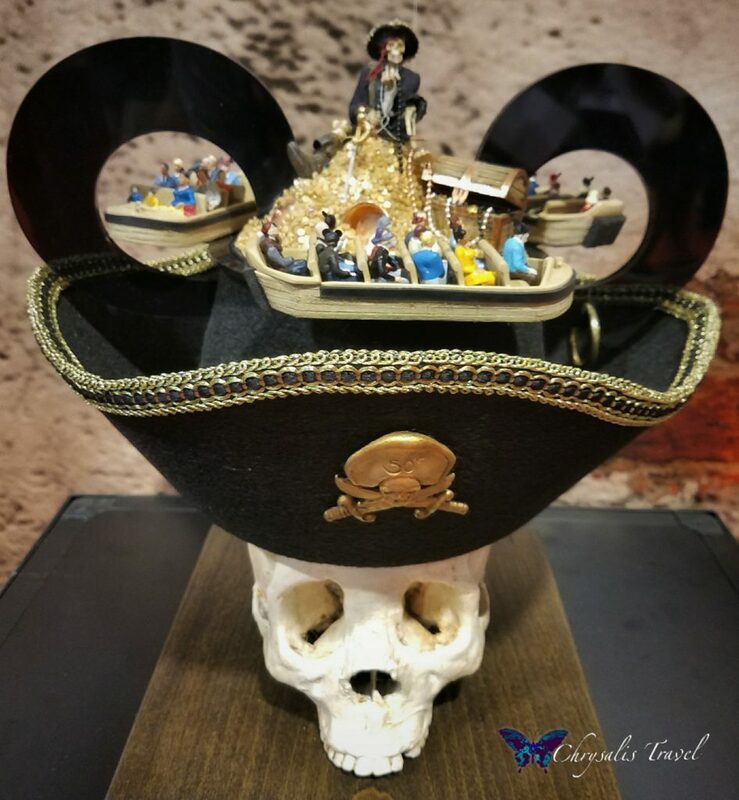 The winner of the Design Challenge was this pirate Mickey Ears hat. Three ride vehicles circle through the Mickey ears on a re-purposed snow globe mechanism that does not require electricity. Long before Disneyland, Walt had a fascination with pirates. They appeared in some of Walt’s early films, the “Alice Comedies” – a series of mixed live action and animation shorts in the 1920s. 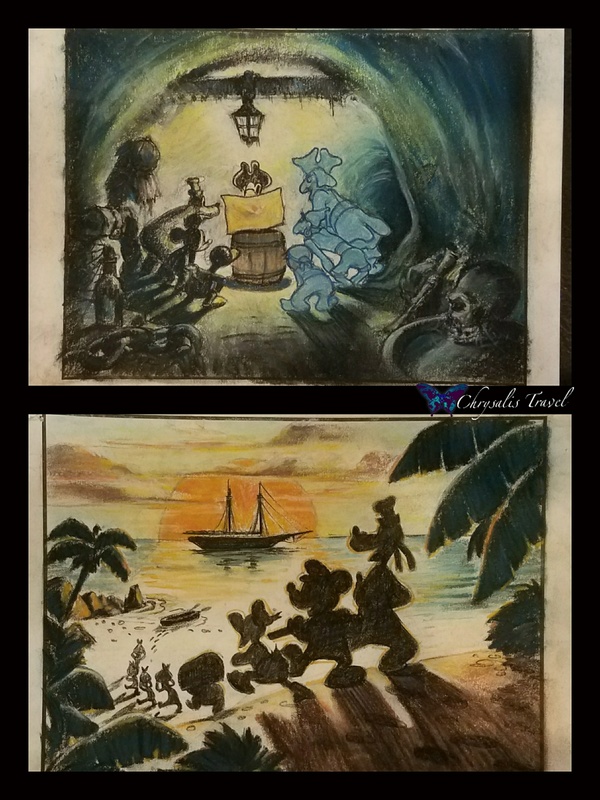 Mickey and friends also got into the action with pirate adventures in some of their early shorts. 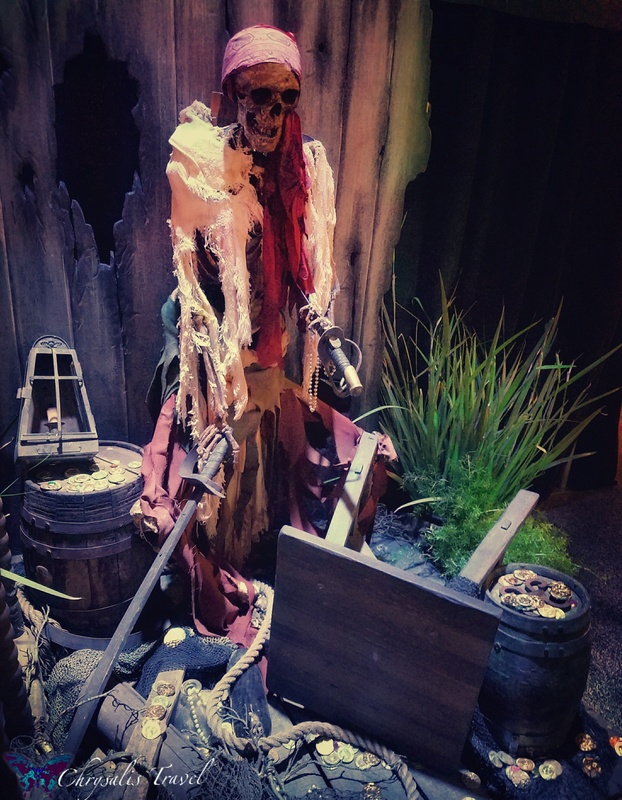 Pirate “Captain Bartholomew Gore” didn’t quite make the cut as one of the 999 “happy haunts” in the Haunted Mansion. 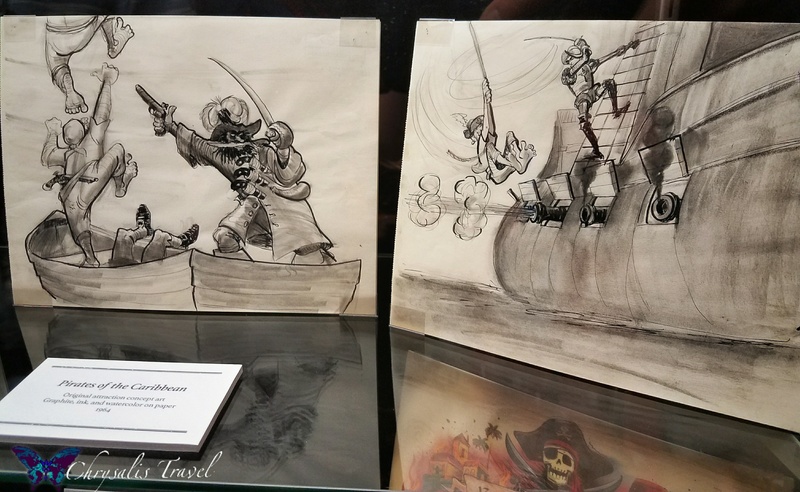 However, these early sketches by Ken Anderson (1957) may have inspired Imagineers on another project. 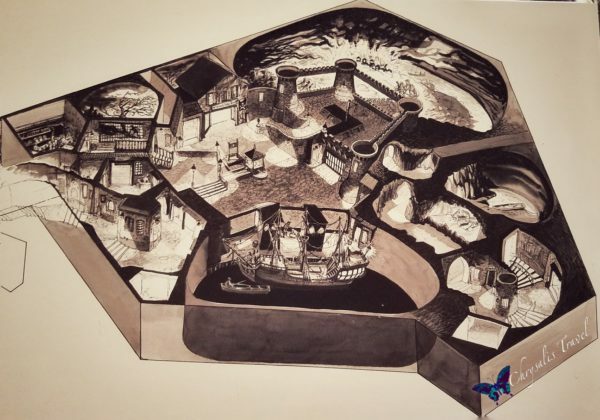 When it came to developing a new attraction for Disneyland, pirates were a natural theme to explore. The original proposal circa 1963 was for a ‘Pirate Wax Museum’ walk-through attraction. Guests would wander through various pirate-themed rooms, including a battle scene and pirate ship. This sketch shows how the attraction would back up to the existing Disneyland railroad track. 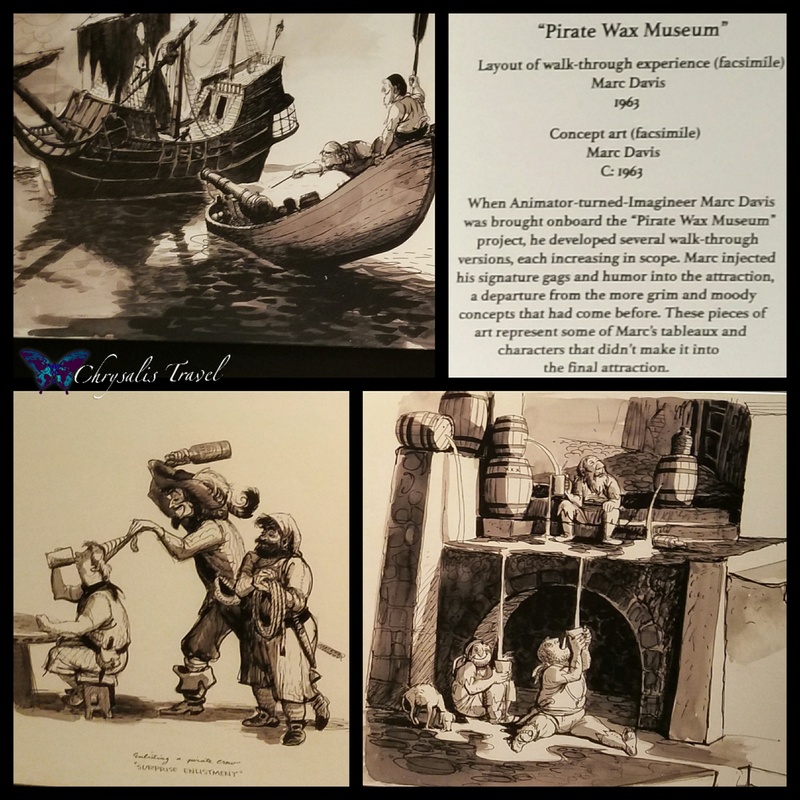 Marc Davis, one of the first Imagineers, was pivotal in developing the look and feel of the attraction. Here are some of his concept art sketches. Pirates was revolutionized after the 1964 New York World’s Fair. Imagineers realized that boat attractions like smash hit “It’s a Small World” have a much higher ride capacity than walk-through attractions. 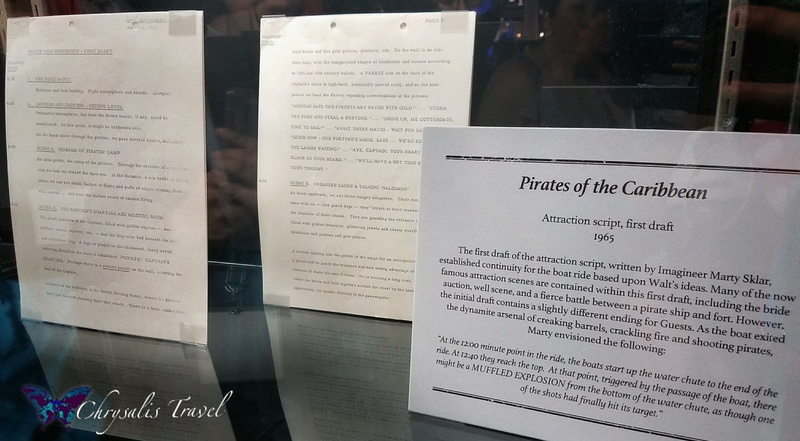 Walt dreamed big, sharing his ideas for Pirates on the “Wonderful World of Disney” television show. This included, of course, riding a boat up a waterfall. Imagineer Marty Sklar was enlisted to write the script for Pirates. He shared this story at the Pirates panel at D23. 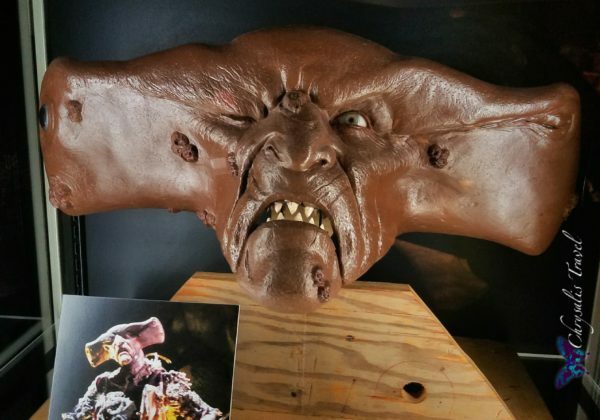 Marty was nervous that the script was too long for the ride. Walt loved it, saying that each time, guests would catch only part of the script. They would have to ride it again to hear more. 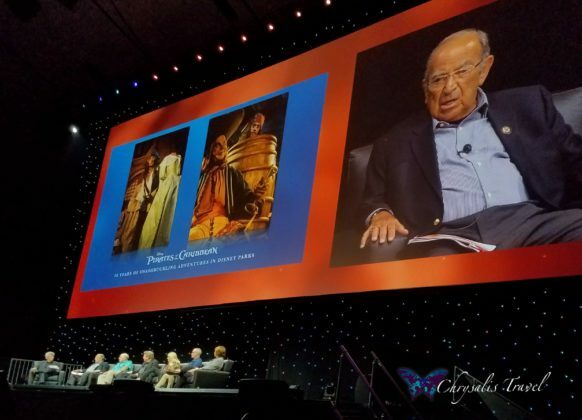 (We will dearly miss Marty Sklar, who passed away just 2 weeks after the D23 Expo). 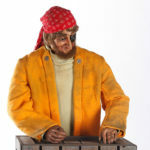 Imagineers invented the latest Audio Animatronic technology for Pirates, creating life-like movements. 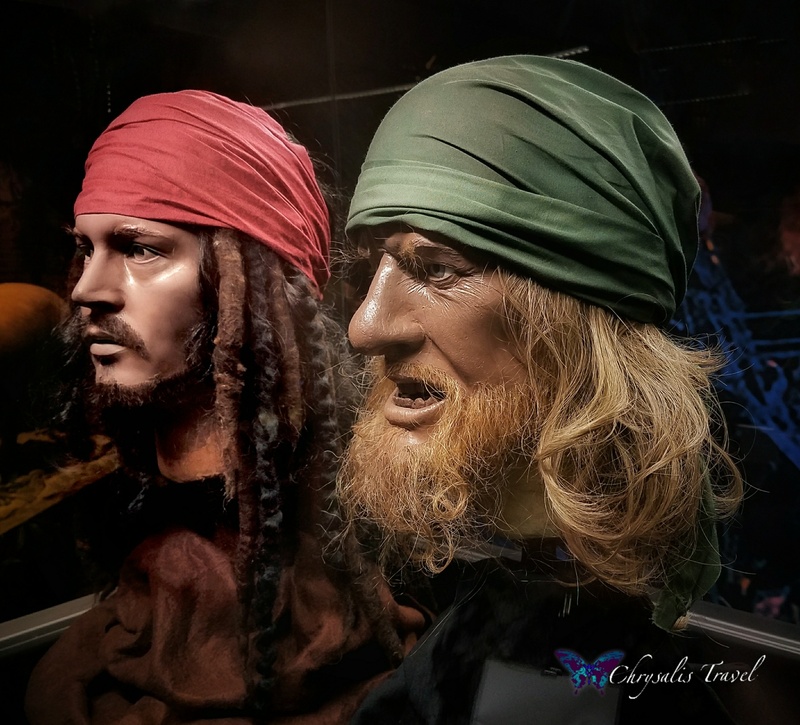 Here are some sculpted models of pirates from the attraction. 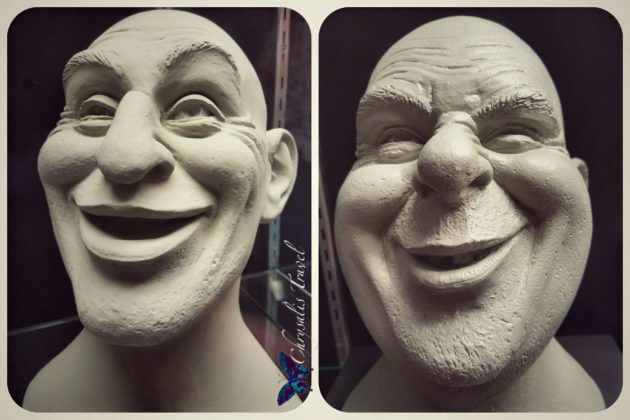 As time went by, animatronic technology improved. 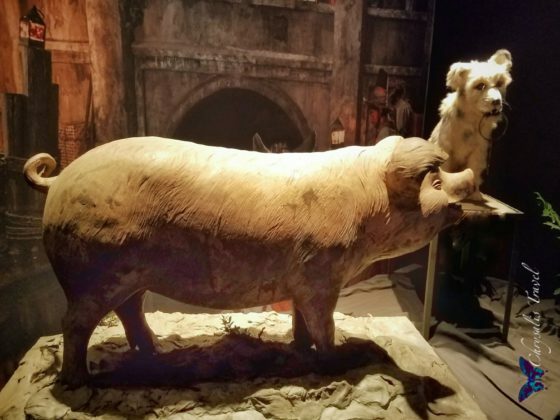 Imagineers updated characters like this ‘retired’ jailhouse dog and pig at Disneyland. 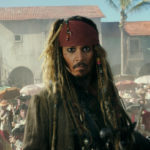 They also introduced Captains Jack Sparrow and Hector Barbossa into the attractions to provide some continuity with the films. Who knew that 50 years later, we would be celebrating the next generation of Pirates at Shanghai Disneyland? 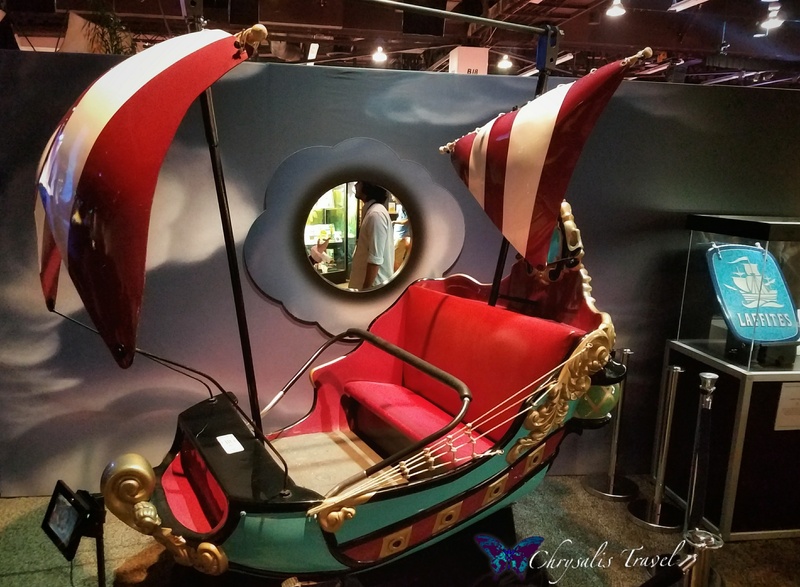 Based entirely on the blockbuster films, this attraction enlists the most advanced boat ride system and special effects of any of the Pirates attractions so far. 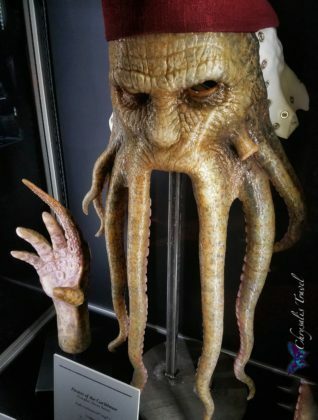 Here are animatronic models of Davy Jones (seen in the video at 4:31) and Maccus (at 4:14) from Shanghai. Captain Hook is an undisputed Disney favorite. 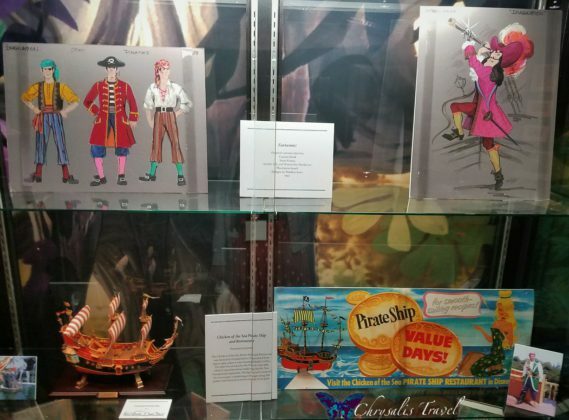 From the Peter Pan animated feature (1953), to an opening attraction at Disneyland in 1955, Hook has been an important villain in the Disney universe. Paying homage to Captain Hook, the Archives presented a Peter Pan ride vehicle. 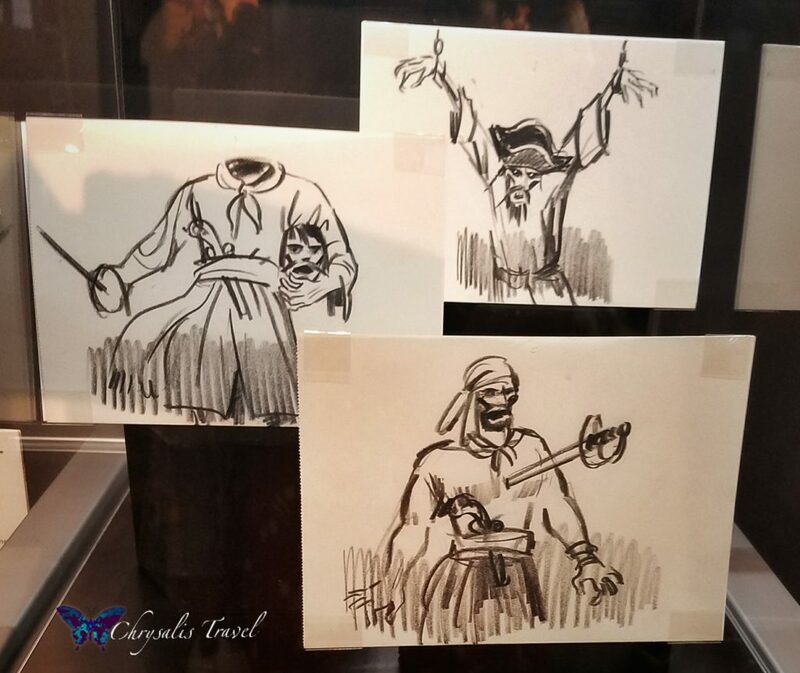 They showcased animation cells from Peter Pan, as well as concept sketches for Hook’s costume in Fantasmic. Hook has also been a pivotal character on ABC Television’s Once Upon a Time. 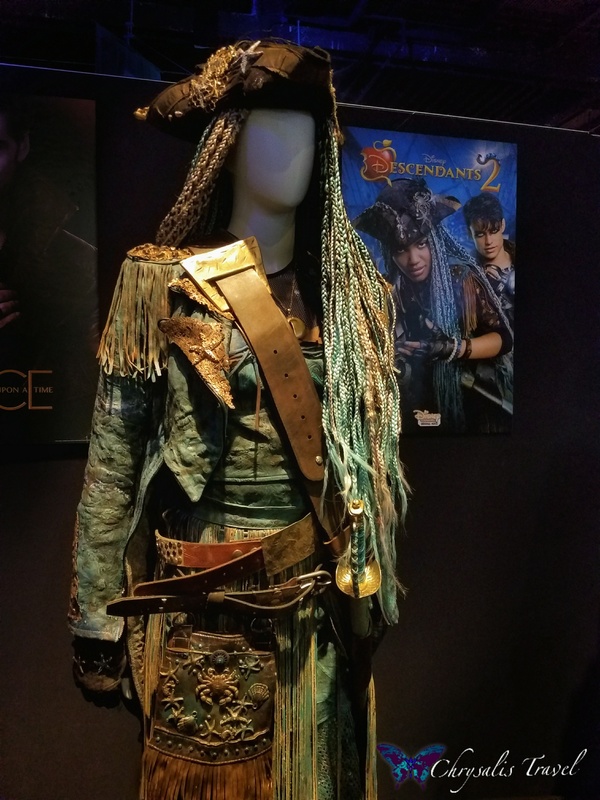 Creators Edward Kitsis and Adam Horowitz have joked that Hook has two costumes for the entire show: a long leather coat, and a short leather coat (worn with the black vest or the red vest). 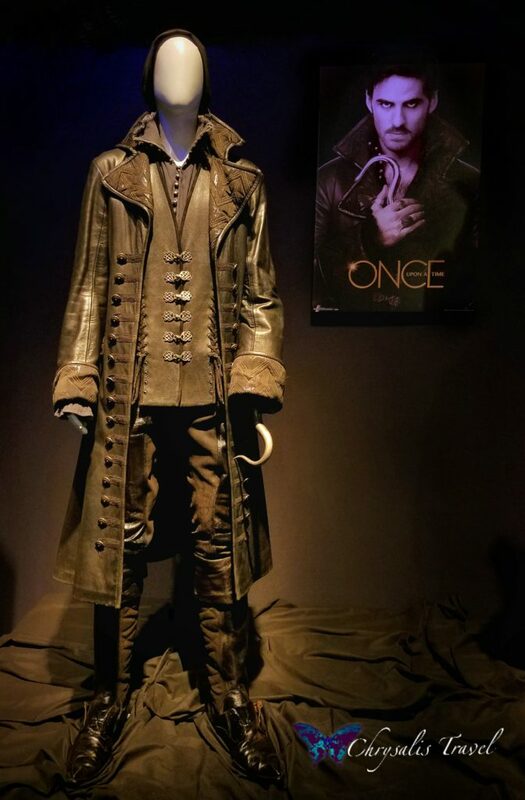 Here is the long leather coat and black vest (worn by Colin O’Donoghue 2012-2017). 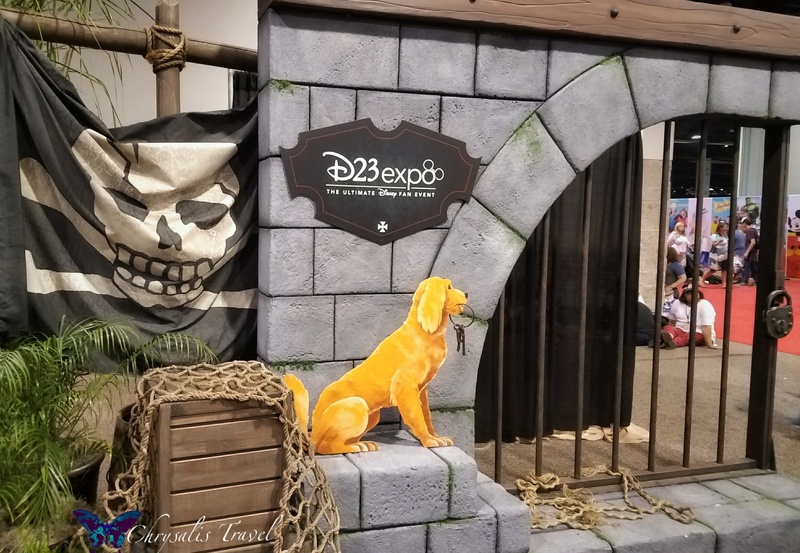 More of our D23 OUAT coverage here. 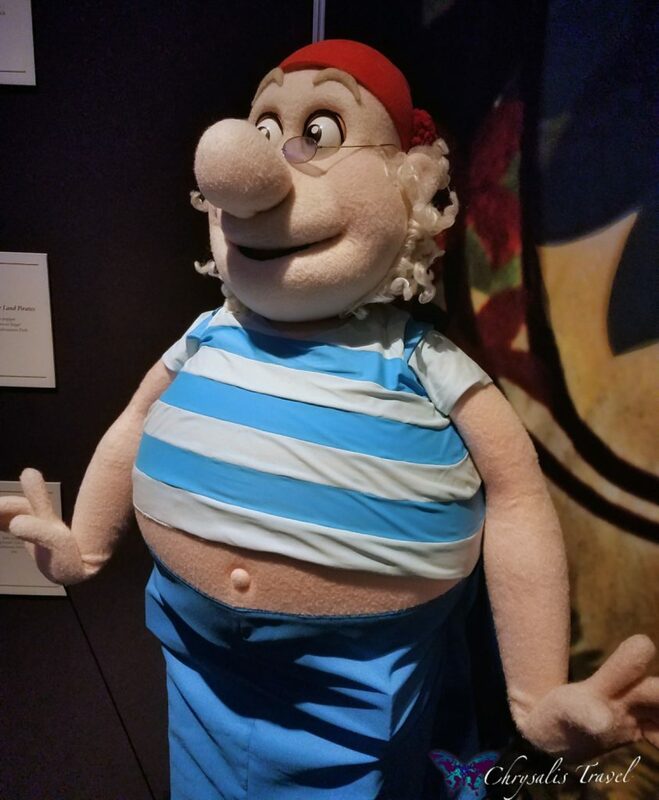 Hook and his trusty sidekick, Mr. Smee, also appeared on Disney Junior’s “Jake and the Never Land Pirates.” They showed up as both animated and puppet characters. 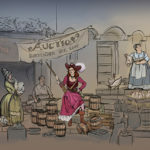 Pirates have been in Disney films long before Captain Jack Sparrow. 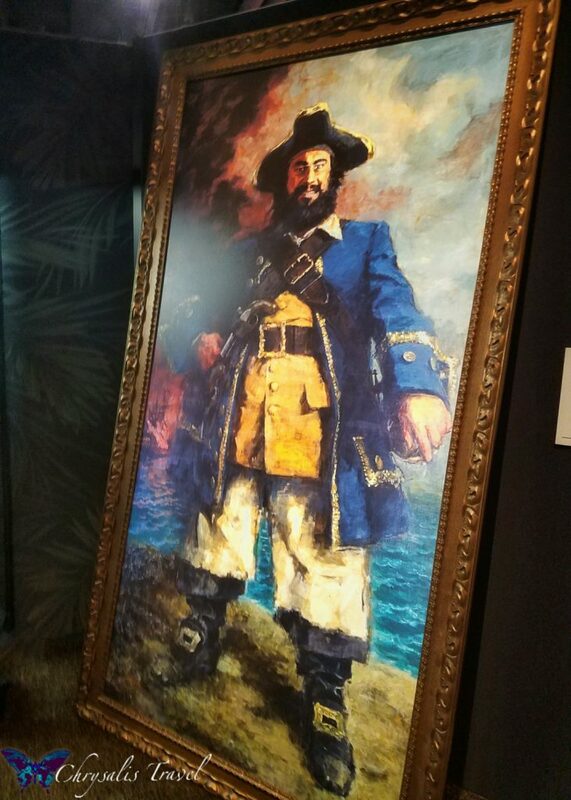 The Disney Archives brought a life-sized portrait of Blackbeard, a replica prop from Blackbeard’s Ghost (1968). One of my favorite Muppet movies is still Muppet Treasure Island (1996). 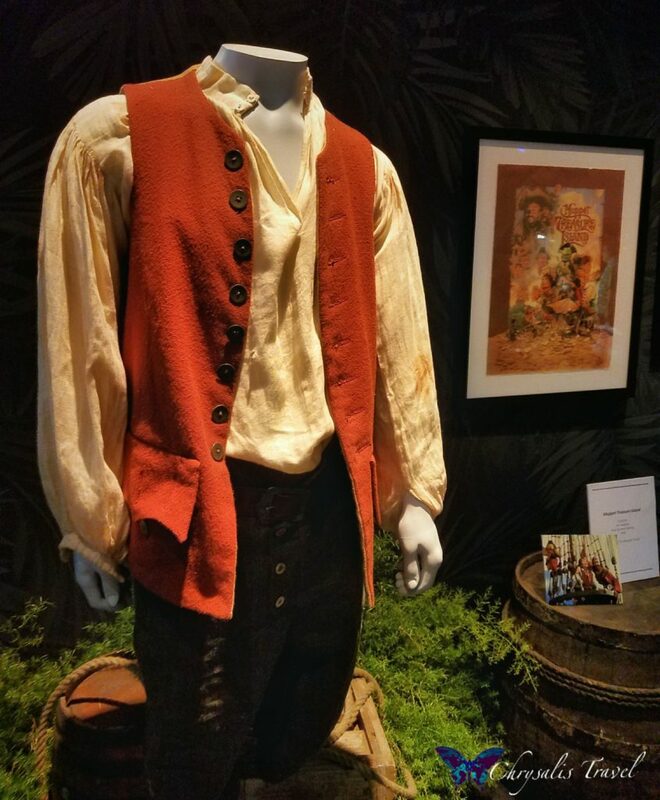 Here is Jim Hawkins’ costume from the film. 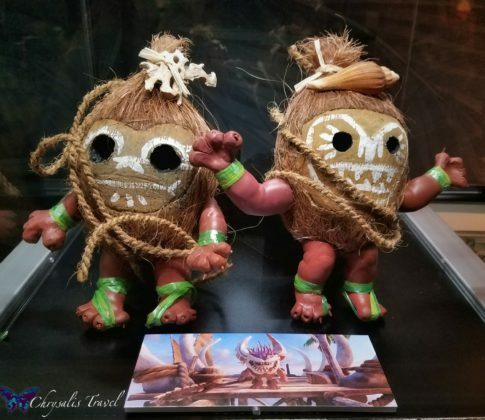 Disney created “kakamora” props from the animated feature, Moana (2016). 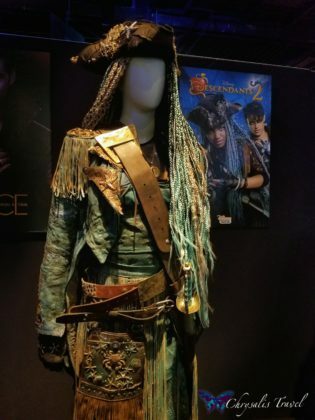 Detailed costumes from Disney Channel’s Descendants 2 (2017) were also represented. So, where is Captain Jack Sparrow? There is much more to come in our next article, focusing exclusively on Jerry Bruckheimer’s Pirates films. Properly warned ye be, says I.